My two years in China were full of delicious new discoveries. Tang yuan was one of them. After a two-week holiday trip to Thailand, I had just returned to the small city where I was living and working in northeast China. I had missed the main celebration of Chinese New Year (or Spring Festival, as most Chinese call it), but was delighted when some Chinese colleagues invited me to celebrate the Lantern Festival with them. This lesser-known celebration marks the 15th day of the lunar new year, around the time most people are returning to work after celebrating the new year with family. 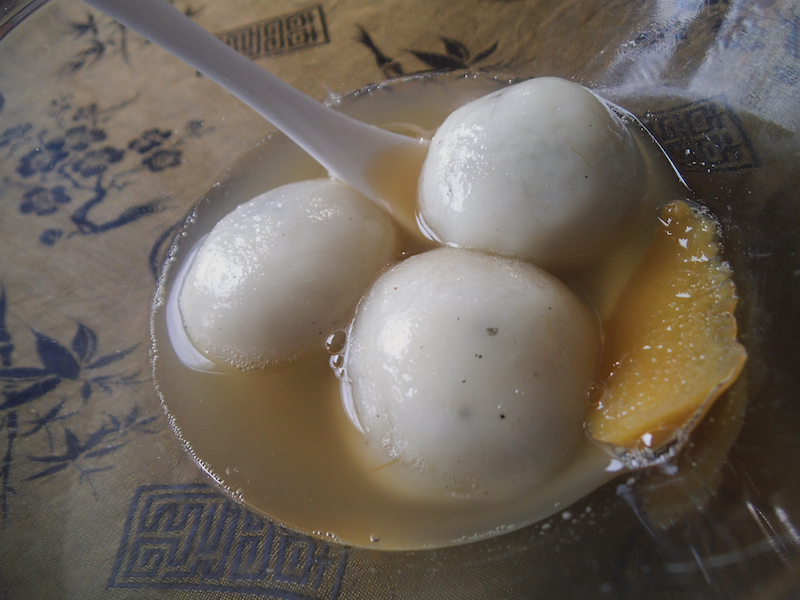 There’s an ancient tale that goes along with why tang yuan are served, which you can read at the Gumdrop Button (and she tells the story well). That very first taste of these sweet dumplings brought a smile to my face. I happen to love sticky rice, which is what the flour for these dumplings is made of. 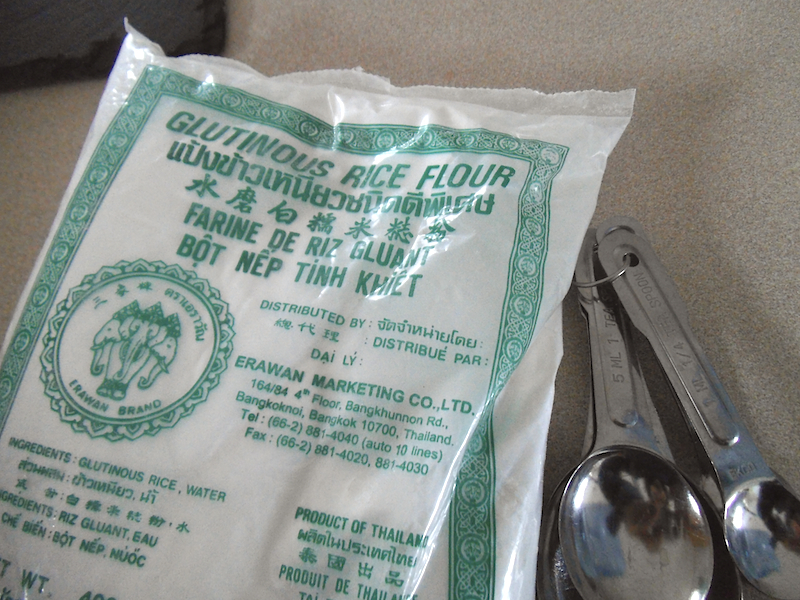 Though the flour is often called “glutinous rice flour,” it contains neither wheat nor gluten. Also known as sweet rice flour, glutinous rice flour tastes wonderful in Asian desserts, where it may be steamed, fried, or in this case, boiled in ginger syrup. These dumplings are chewy on the outside and delightfully different on the inside too, thanks to sweet black sesame paste. Although I have seen frozen tang yuan dumplings for sale in Asian supermarkets, this year I decided to attempt making them myself. They turned out very much like I remembered. 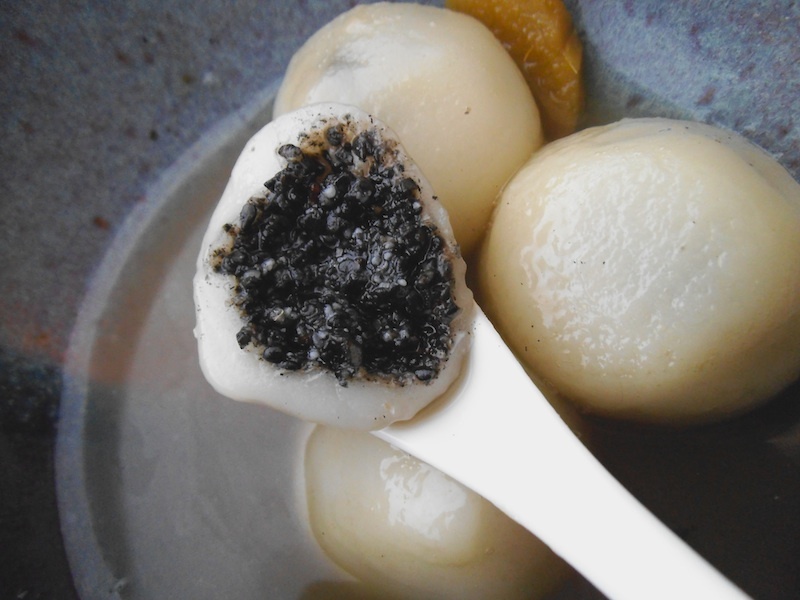 Yet the taste also made me wish to return to the place where I was first introduced to tang yuan and life in a foreign culture. Much has changed in the years since I left, but once in a while I still find myself back on those dusty streets lined with ramshackle shops and student eateries–in my dreams. Grind the toasted sesame seeds in a coffee grinder or high-speed blender until they form a coarse paste. Add the sugar and coconut oil and mix well. If the mixture still seems very crumbly, 2 teaspoons of honey may be mixed in as well. Chill the sesame mixture for 10 to 15 minutes. Form the chilled sesame paste mixture into 16 small balls and gently place them on a plate lined with baking parchment or plastic wrap. Freeze for 40 minutes or longer. To make the dough, mix the glutinous rice flour with 1/2 cup cold water. Knead until a soft, smooth dough forms, adding more water by teaspoons as necessary. Divide the dough into 16 equal pieces and cover them until ready to handle. Take one piece out and coat lightly with glutinous rice flour. Form dough into a round disc, and place a ball of frozen sesame filling in the centre. Wrap the dough around the sesame ball and seal it to close. No black sesame should be visible. Continue the same process with the remaining dough and filling until all dumplings are formed. Prepare the ginger syrup by boiling 2.5 cups of water. Add ginger slices and sweeten with raw sugar to taste (I used 3 tablespoons). Boil for 5 minutes before adding the dumplings. Continue to boil and stir the dumplings gently until they float to the top of the syrup and become translucent. Serve the cooked tang yuan in bowls with the sweet ginger syrup. I’m sharing this at Fiesta Friday, Savoring Saturdays, and here. They look so delicious. And as we had a similar dessert in Vietnam a couple of months back I can totally imagine how they taste. Ours were filled with shredded coconut though. Yes, there is a lot of overlap between the two countries. In Vietnam I also enjoyed the fried rice balls that tasted like donut holes. Did you encounter those? Thank you for posting this! I’ve always wanted to learn to make these dumplings – one day soon…! 🙂 (They’re my favourite Chinese dessert and I’ve found one Chinese restaurant in Barcelona that does them) Yours look great!!! Hi, do you remember which Chinese restaurant in Barcelona! I will be traveling there very soon! I am heading to Chinatown this weekend in Philly for the Lunar New Year festivities and will look for some of these to try! Happy FF! Happy Fiesta Friday and Chinese New Year! Sounds like you will be having quite the weekend! Enjoy! These look and sound delicious! I have a Taiwanese recipe for black sesame dumplings that I keep meaning to make but they are a little different. I love the ginger with these, I can see why you were glad to have them! Thanks, Michelle! Try them when you’re up for an adventure! They look amazing! What a dumpling! Thanks, Ginger! They’re one of my favourite Asian desserts! Sixteen dumplings is a fair amount, so it’s best shared with a group. Or you can freeze the dumplings before boiling them and make just enough for that day.